The hilarious and heartfelt chronicle of a woman learning the secrets of love, health, and happiness from some very surprising teachers: her dogs. "You Had Me at Woof" is the often hilarious and always sincere story of how one woman discovered life's most important lessons from her relationships with her canine companions. From Otto, Julie realized what it might feel like to find "the one." She learned to share her home, her heart, and her limited resources with another, and she found an authentic friend in the process. But that was just the beginning. Over the years her brood has grown to one husband, one daughter, and several Boston terriers. And although she had much to learn about how to care for them-walks at 2 a.m., vet visits, behavior problems-she was surprised and delighted to find that her dogs had more wisdom to convey to her than she had ever dreamed. And caring for them has made her a better person-and completely and utterly opened her heart. Riotously funny and unexpectedly poignant, "You Had Me at Woof" recounts the hidden surprises, pleasures, and revelations of letting any mutt, beagle, terrier, or bulldog go charging through your world. 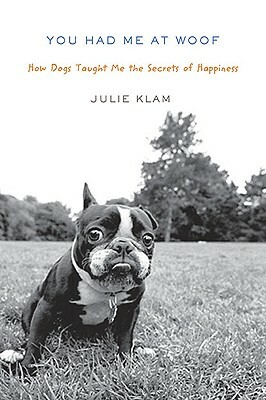 Julie Klam grew up in Bedford, New York. After attending NYU's Tisch School of the Arts and interning at "Late Night with David Letterman," she went on to write for such publications as "O, The Oprah Magazine, Rolling Stone, Harper's Bazaar, Glamour," and "The New York Times Magazine" and for the VH1 television show "Pop-Up Video," where she earned an Emmy nomination for Outstanding Special Class Writing. She married the show's producer, Paul Leo. They live with their daughter and three dogs in Manhattan.